We are bombarded with messages about our bodies: too thin, not thin enough; not in vogue, not smooth-skinned enough, not the right shape, not covered enough or covered too much.... 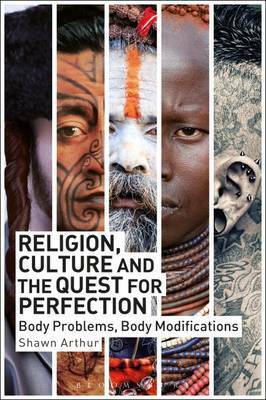 Religion, Culture, and the Quest for Perfection: Body Problems, Body Modifications analyses these concerns and perceived problems, asking us to examine our biases, and provides insights into why we think about our bodies in the ways that we do and why body modifications are so prevalent among the human community. Introducing readers to major figures in body studies, Shawn Arthur analyses why humans seem so preoccupied with changing the body to meet religious, social and psychological goals. Examples of perceived body problems are taken from the media and specific religions, including Judaism, Christianity, Islam, Hinduism, Buddhism, Daoism, and Contemporary Paganism. Specific examples of body modification are explored, ranging from cutting one's hair, painting nails to cosmetic surgeries, transgender surgeries and female genital mutilation. The author shows how attitudes to body modification have changed both culturally and religiously over the past 50 years, and discusses a wide range of current world issues such as the Muslim veil and modesty concerns, and the extreme lengths that many religious ideologies espouse to forcibly modify young men and women's genitalia. Shawn Arthur is Associate Professor of Religion, Appalachian State University, USA. He is the author of Early Daoist Dietary Practices: Examining Ways to Health and Longevity (2013).